Enabling clients for SMS & Email - individually & all at once. Simple Inked is designed to send your clients SMS & Email Reminders and Promotions. In order for your clients to receive these SMS's and emails, they need to be enabled for SMS Reminders/SMS Promotions and/or Email Reminders/Email Promotions. 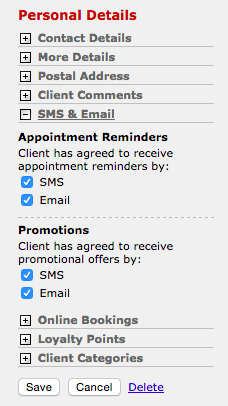 You can enable clients for all or any of these message types individually, or for all clients in one go. On the right side panel search for your client. Click their name in the Search Results and you'll be taken into their client card. In their Details section, click Edit. On the right side panel expand (+) the SMS & Email section, then tick all or some of the options there - Appointment Reminders for SMS and/or Email, Promotions for SMS and/or Email. Then click Save. The client has now been enabled for these message types. You can come back in here anytime to change their preferences. Enabling all clients in one go. Go to Admin, then into the SMS & Email tab. Under the 1-Touch Marketing section you'll see the Enable ALL Clients For: drop down menu. Drop down the menu and choose one of the options at a time i.e. SMS Reminders. Then click GO. Now, pick the next one i.e. SMS Promotions, and click GO. Keep doing this until you have clicked GO for all the options you wish to enable all of your clients for. All of clients have been enabled for those message types.